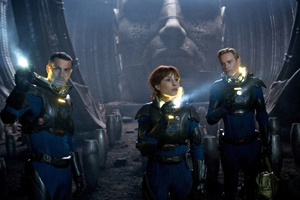 Prometheus has the mix of science fiction and horror that young men of college age crave. It has the colorful cast of characters you’d expect to see in a war film. It has enough subtlety of plot to withstand multiple viewings (unless that “subtlety” is actually plot holes — I am not sure after only one viewing). And it has the weight and grand scope of a mythic journey. Even if it’s practically the same movie as Alien, what’s not to like? The title comes from the name of a private space ship, launched to find the proto-humans who gave us their DNA. Future archaeologists will discover that we humans didn’t evolve from other primates; we were created by an offworld race they call “Engineers.” They discovered an “invitation” to a distant planet from whence we came. Dialogue about creators and creations sounds more like Christian mythology than Frankenstein. Isaac Asimov did it better with his robots facing human creators, but a Christian spin is more original in this genre. The mission is financed by an eccentric hundred-year-old trillionaire named Weyland (Guy Pearce in pounds of makeup — why not just hire an older actor?). While the humans cryo-sleep, David (Michael Fassbender), a lone robot, watches the new 3D version of Lawrence of Arabia to try to learn to better emulate us. They land on the planet indicated on the cave paintings — Scott knows to pull back to give us some idea of the scope of the place — and go to a nearby rock formation for a look. One of the first things they find in the caverns is a giant Buddha head surrounded by small pedestals in a room that looks like the egg chamber in Aliens. The pedestals start melting with crude-oil DNA solvent which we saw in the film’s prologue. An oncoming storm cuts this first expedition short. Two redshirts get sidetracked while the main detachment heads back to Prometheus. Not to give away too many details, let’s say that back at the ship, things get dark. David’s evil programming kicks in. A child is conceived in a sterile womb. A crew member seems to be infected with a parasite. The cold-hearted Weyland representative (Charlize Theron) shows her ice with fire. Moviegoers familiar with Alien will recognize a lot of the gloom, doom, and infection that besets the crew of the Prometheus. Stickler for plausibility may have some problems with Prometheus. For example, the scene that will probably come to epitomize this movie involves abdominal surgery. I can tell you that even with 80 years of medical progress, people of 2092 will still not be able to sit up after cutting abdominal muscles, much less run from an attacker. Even stitching the flesh back together won’t be enough. To be honest, I’m not sure the alien/human biology makes sense. Combining human and protohuman DNA seems to yield monstrous results. Or maybe there’s some monster DNA in the mix too. I’m not sure after one viewing. And those monsters found swimming in the crude — are they of the crude, or just in the crude? I trust that Ridley Scott and screenwriters Jon Spaihts and Damon Lindelof have carefully plotted this story and haven’t made any mistakes — fans who see the movie multiple times on opening weekend can tell me whether the perceived holes are holes, or are explained by remarks and clues mentioned elsewhere in the film. Still, I liked Prometheus. The film is essentially a clone of at least two of Alien movies, but that need not be a criticism. I went through my sci fi movie phase in college. I sought out all the greats of the genre. I dipped into the dregs, looking for that gem I was sure must still lie undiscovered in the stack of LaserDiscs. There just weren’t that many good big-budget science fiction films. I would rather see something that recycles another story — and does it well, as this one does — than see something truly original but half-baked. You can see Prometheus in 3D, but I don’t feel like it’s essential. The only scene in which 3D carries additional information is the clip from Lawrence of Arabia.